Red tides are caused by an explosive growth and accumulation of certain microscopic algae, predominantly dinoflagellates, in coastal waters. 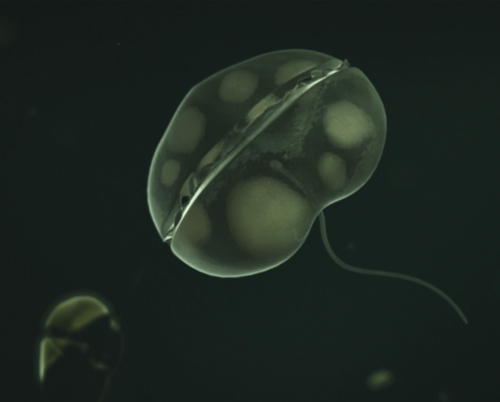 Some species of dinoflagellates produce toxins that are among the most potent known to man. These harmful algae blooms, or HABs for short, pose a serious and recurring threat to human health, wildlife, marine ecosystems, fisheries, coastal aesthetics and our economy. The most troublesome species in the Gulf of Mexico is Karenia brevis. 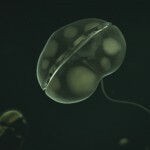 Like other dinoflagellates these tiny, single-celled organisms photosynthesize using chlorophyll like a plant yet they are mobile with the use of two flagella that propel them through the water column. The dinoflagellate Karenia brevis, or K. brevis, is the predominant red tide organism in the Gulf of Mexico and it can also occur on the Atlantic side of the Florida coast. 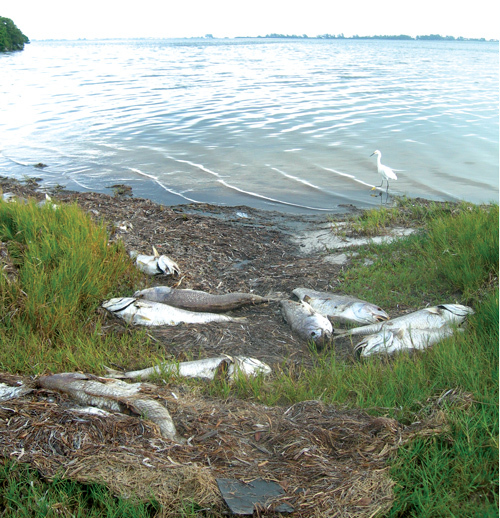 The organism can kill fish in vast numbers, make shellfish poisonous to humans and release toxic airborne irritants that drive coastal residents and tourists from our beaches. In the Gulf of Mexico, K. brevis blooms appear to originate 10 to 50 miles offshore along the continental shelf, in what have been termed “initiation zones.” Some scientists think the Loop Current, which brings Caribbean seawater to Florida’s West Coast may initiate a bloom by causing an upwelling of nutrients as the force of the current surges against the shelf, thus creating favorable growing conditions. The red tide is then transported into the nutrient-rich shallow waters by winds and/or currents, where it continues to multiply to harmful levels. Other scientists like Dr. Richard Stumpf, suggest that NOAA research models point to a summertime wind shift in the Gulf that changes the direction of the outward flow of the Mississippi River plume from the Western Gulf of Mexico to the Eastern Gulf that heads toward the West Coast of Florida. 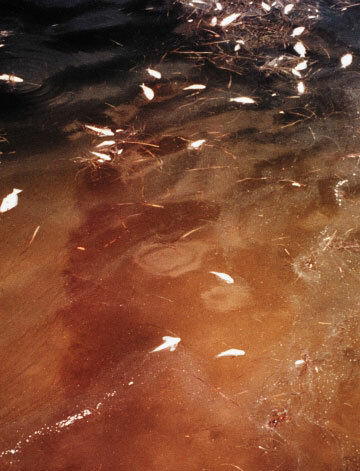 The nutrients, both natural and man-made, that travel downstream in the Mississippi River plume may be the stimulant that leads to a red tide bloom. In either nutrient-generating scenario, the confluence of the three basic elements needed to initiate a bloom would be present.